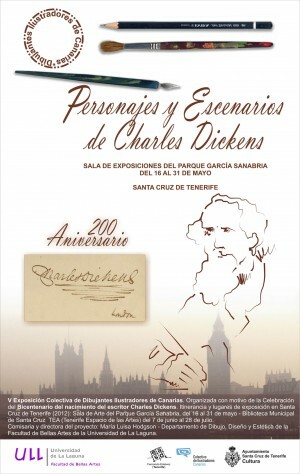 An exhibition of drawings and illustrations on the theme of ‘Character and Scenes from Charles Dickens’ organised by the Faculty of Arts and Laguna University in Tenerife that brings together a large number of graphic artists who rediscover and recreate the ‘world of Dickens.’ With his universal themes of society and its injustices, the works of Dickens deserve to be interpreted by a younger generation. The illustrators accentuate the great wit and irony of the writer and focus on some of his favourite characters who were often children who reflected events from his own life. More than sixty artists come together to show their visual responses to Dickens’s work. The works on show are in a range of styles: drawing, watercolor, mixed media, painting, collage and digital art. 16th May – 1st June Sala de Arte del Parque García Sanabria de Santa Cruz de Tenerife, 2ndJune- end of July Biblioteca Infantil y Juvenil TEA (Tenerife Espacio de las Artes).